At VRLA, GimbalGuru showed a wearable base mount for the Guru 360 gimbal for 360 cameras (reviewed here). Guru 360 is the first affordable gimbal for 360 cameras. 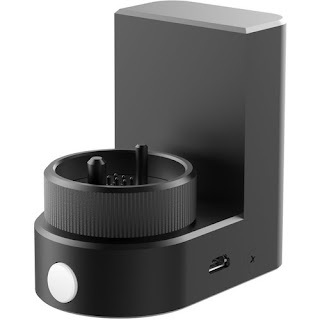 One of its unique features is that it is modular and interchangeable with Moza gimbal accessories such as the Mini-C head for smartphones or the Mini-G head for GoPro cameras, without any tools. 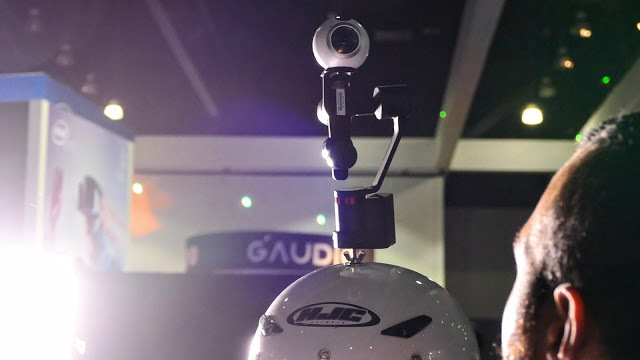 At VRLA, GimbalGuru showed the Moza Mini wearable base mount, which allows you to mount the Guru 360 gimbal (or the Mini-C or Mini-G) on a helmet or other surface. The Mini base has its own rechargeable battery. As you can see, the gimbal keeps the horizon level on the 360 camera while mounted on a helmet. One of the interesting features of the wearable base is that you can control the head wirelessly with the same handle that you use for the gimbal! This latter feature is still in beta, which is why I couldn’t get a video of it. – The wearable base is available by itself for $99 from B&H Photo. Take note that it only works with a Guru 360 head or a Moza Mini-C or Mini-G.
– The Guru 360 gimbal is available directly from Gimbal Guru at the introductory price of $299. – There’s a kit that includes a Mini-G gimbal for GoPro plus the wearable base mount from Amazon.